Tofu or not Tofu, that’s the question. Vegan sausage rolls have been hitting the headlines and national news in the UK. Not just very successful PR but an echo of my Christmas party discussions: a fellow guest had given up eating all animal products because of the environmental impact of methane, de-forestation to increase grazing land, the chemical inputs to factory farming and more. The debate about eating less meat to save the planet is hotting up. If you want to try a half-way house, see the tofu dish I learned in China (https://youtu.be/j4QuNQxxyi0) which cuts the amount of meat but keeps the flavour with a little beef. 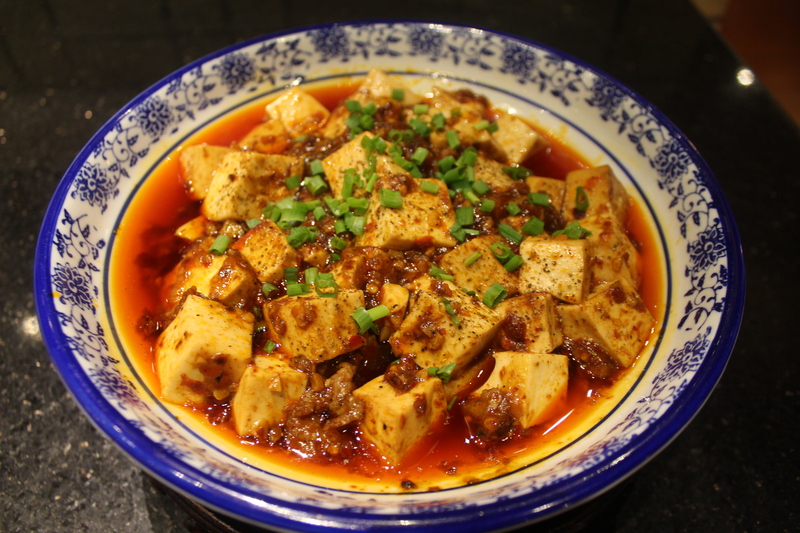 Professional chef Tony showed me how to transform pale, rather tasteless chewy cubes of bean curd in to a typical Chongqing dish: Lao LAN Ma or Sichuan-Style Braised Spicy and Hot Tofu. There was a little simmering and frying plus lots of the strong flavours so popular in the local cuisine. The beef (so finely minced that it was nearly a paste), some “chicken powder” similar to a crumbled stock cube plus chilli and the famous local pepper made all the difference. And Head chef Jack couldn’t resist taking charge of us both. If we want to cut our meat consumption, there are lots to learn from the kitchens of China and other countries if we can be open-minded to alternatives that have already stood the test of time and satisfied millions of people. And there are new ideas emerging all the time: already, scientists are trying to “grow their own meat” in the laboratory. The key question remains: will those meat substitutes bring enough profit for the food industry? There need to be alternatives that grab the taste buds of the mass market if whole areas of food production are going to change or even end. We aren’t there yet but tofu has a part to play – even if you don’t have the special Chinese sauce made from fermented broad beans that added to this dish. And all thanks to the Chongqing Rotary Club that made this visit possible – next time, we are cooking with two of the local blind women assisted by the Club.